Today is Inauguration Day, the 4 year anniversary of when Barak Obama was first sworn in as the 44th presided of the United States of America. On this day, I wanted to take a look at the real estate market in Austin and see how it had performed over the past four years. Whether you approve or disapprove of Obama as president, whether you agree with his policies or disagree, you cannot argue with RESULTS. I have taken a simple look at how the real estate market in Austin has changed from the year prior to Obama taking office (2008) to last year (2012) and also looked at some of the market data for the years in between to give us a good picture of how the market has changed. While you cannot disagree with results, I am not contending that any change, good or bad, is a direct result of any Obama policies or directly correlates to the changes he has made. This just a look at how the Austin market has performed during his term. The year prior to Obama taking office (2008), 8585 homes sold in Austin. In 2010, home sales in Austin dropped to only 801, their lowest point during Obama’s tenure, but grew to 10,356 in 2012. 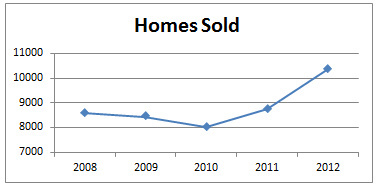 Austin home sales in 2012 represented a 21% versus 2008, a tremendous increase. Average Sales Price and Average Price Per Sqft. In 2008, homes in Austin sold for an average sales price of $310,417 but the number dropped to only $300,226 in 2009. By 2012, the average sales price had rebounded to $342,517, the highest point in the past 5 years and a 10% increase over 2008. The average price per sqft. (PPS) had similar changes to average sales prices but not quite as much change. Homes in Austin sold for an average of $141.83 PPS in 2008, shrunk to $134.83 in 2009 and grew to $145.83 last year. In 2008, homes took 59 days on average to sell. That time period peaked at 69 days in 2009 but was down to only 52 days in 2012, a 12% reduction from 2008. While I have not included median vs average numbers for most of these statistics, for days on market it is definitely noteworthy because a few homes that sat on the market for an extended period of time can skew the average numbers. For median numbers, homes sold in Austin in an average of only 24 days, down 38% from 2008 (39 days) and down 47% from 2011 (45 days). I hope that this information is insightful. If you have questions about your particular neighborhood and how your home’s value might have changed over the past few years, drop me a note or give me a call and I would be happy to discuss this with you and get this information to you. If you found this interesting, please Like My Page on Facebook! ← P. Terry’s Comes to North Austin. FINALLY!